Food and drink is a key part of the Royal Bath & West Show, with a tremendous showcase of top quality local suppliers, many of whom have their origins firmly within the farming community. One of the must-sees for foodies at this year’s event is The Meat Men. 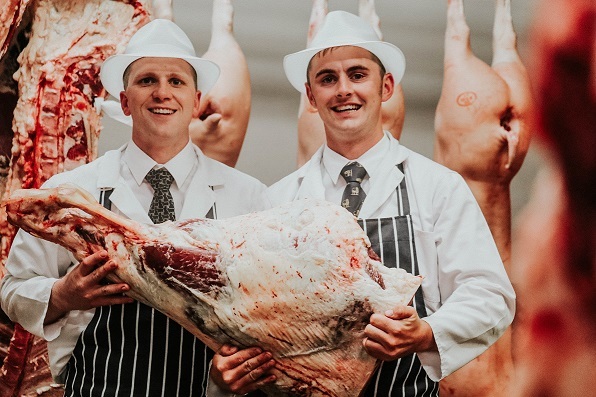 Established last year by master butchers Scott Cartwright and Edward Davies, they will be serving all manner of quality meat for visitors to enjoy. Edward keeps a handful of Limousin show cattle which he shows at various events around the country, winning the championship at Agrifest and Newbury Show in the past few years. “I won’t have time to show them at the Bath & West unfortunately,” he laments. Edward got involved in the family butchery and abattoir after leaving school aged 17 – and that’s where he met Scott, who was working there as a butcher. It was around this time that he got involved with cattle showing and judging with his local Young Farmers Club, which gave him a real understanding of what butchers are looking for. Fast forward 11 years, and the pair reunited after a spell of travelling, during which Scott brushed up on his butchery – learning different skills abroad. Once back on Somerset soil they decided to set up a new business – The Meat Men. Although both only 28, they have the ideas, aspirations, skills and experiences that set them apart from their competition. They also operate a delivery service around the country. “We deliver right up to Scotland and Yorkshire, with a courier we can deliver anywhere in the UK,” he adds. And they have a few awards under their belts too, after coming away from the steak competition at Agrifest in Exeter last year with a gold and two silvers for their ribeye, sirloin and steak burgers, respectively. The business is a real family affair and the boys have roped in their girlfriends and mothers to help on the stand at the Show. If you like what you try, they have prepacked meat available too, which they can keep refrigerated until you’re ready to pick it up. But if local meat just isn’t your thing, there’s plenty of other food and drink on offer at the Show. From vegetarian and vegan delights at the Authentic Indian Cuisine stand to Green Bean; the gluten-free, dairy-free specialists, there is something to whet everyone’s appetite.